Cat Boccaccio poses her tantalizing 14 questions to builder, photographer, and machinima artist, Rhonda Saunders. 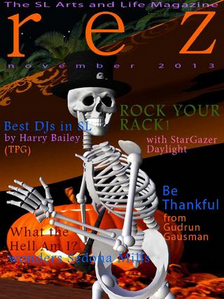 The Perfect Gentleman, Harry Bailey, gets the lowdown on two of SL's best DJs, Hy Gynoid and BigJack Rolls in his piece DJs in SL (Part Deux). Sedona Mills asks the perennial existential question in her article Who The Hell Am I? Crap Mariner celebrates the life and times of American icon, Lou Reed, in his contribution, Lou Reed. Our stalwart, Gudrun Gausman, explores the American tradition of Thanksgiving and asks whether it's better celebrated in SL or RL. Adrian Blair contemplates essential truths in his lovely poem, The Hundred Selves. StarGazer Daylight brings us her own insights about breast cancer and the prospects for finding a cure in Rock Your Rack.